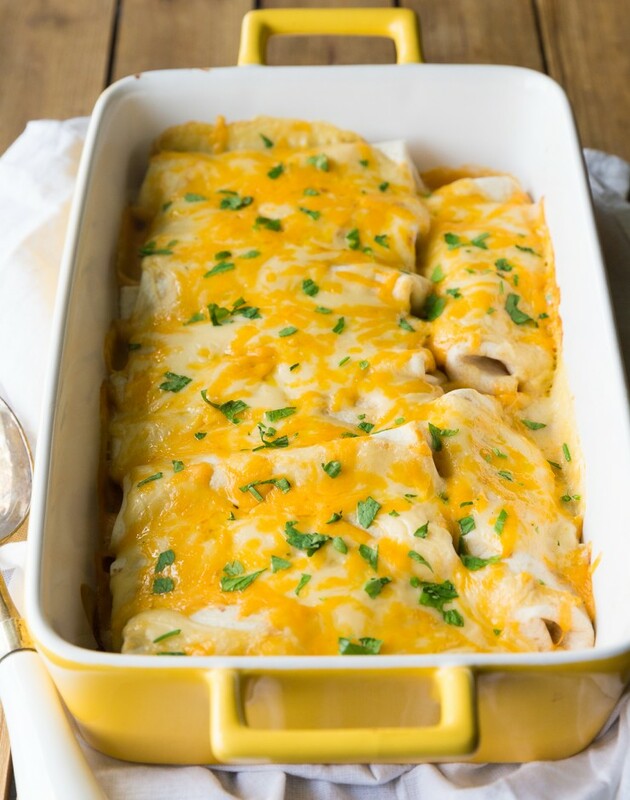 Cheesy Chicken Tortilla Bake - Frugal Mom Eh! 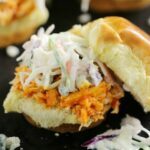 I’m excited to be guest posting on Frugal Mom Eh -‘ this is a delicious recipe my family has made for years. An easy dinner filled with delicious cheese sauce and chicken. 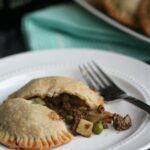 The best part is that it is inexpensive and can be made ahead of time and reheated. Plus, it freezes well too! In a medium saucepan place Miracle Whip, flour gradually stirring in milk. (CAUTION: mixture will lump if not whisked quickly while adding milk) Once thickened (approx. 5 mins) add 1.5 cups of cheese, cook until melted. Take 1 cup of sauce out and set aside. Add cilantro, chicken and salsa to saucepan. Fill each tortilla with mixture – fold in ends and roll. Place in baking dish seam side down. 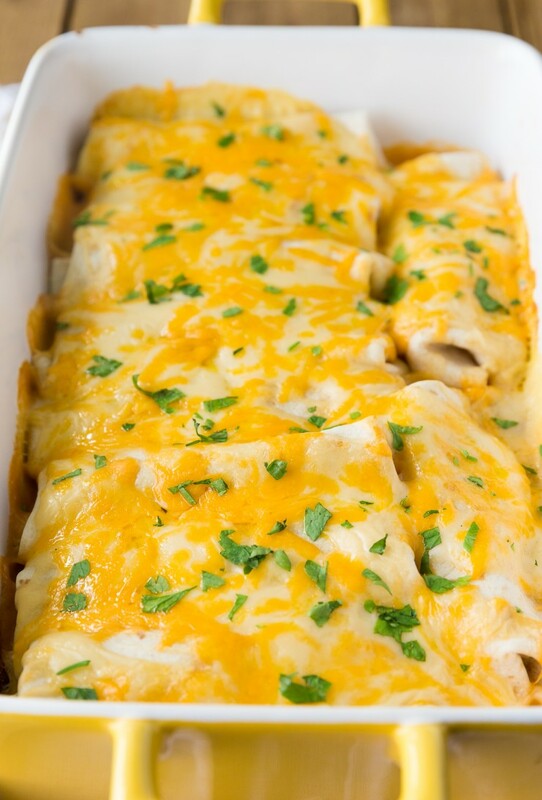 Once all are filled and rolled pour reserved 1 cup of sauce over tortillas, top with 1/2 cup shredded cheese. Bake 25 minutes or until golden brown and heated through. An easy dinner filled with delicious cheese sauce and chicken. Fill each tortilla with mixture - fold in ends and roll. Place in baking dish seam side down. 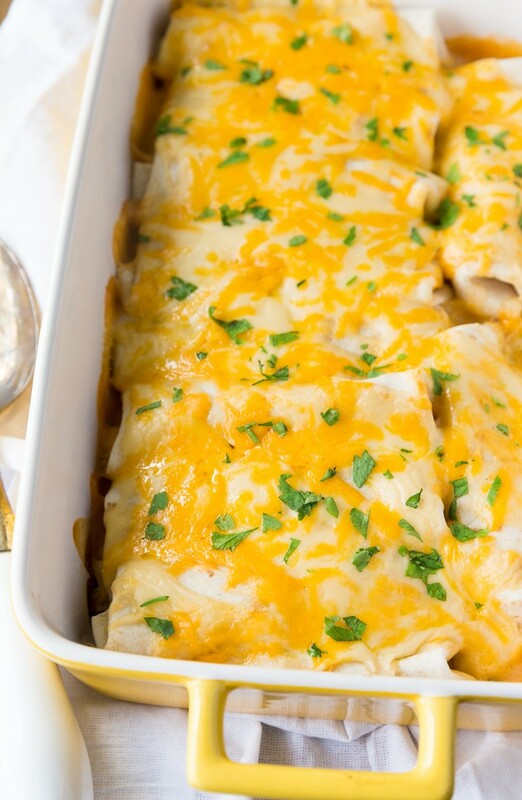 Once all are filled and rolled pour reserved 1 cup of sauce over tortillas, top with 1/2 cup shredded cheese. 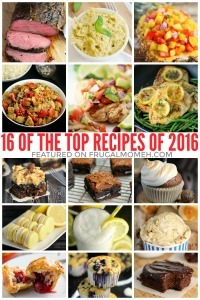 Kerrie loves making recipes that are easy, delicious and include lots of real, yummy ingredients. Kerrie blogs at Family Food and Travel about her three passions: her twin boys, delicious food and fantastic family travel. 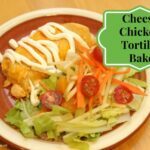 This recipe for Cheesy Chicken Tortilla Bake was originally published in January of 2014 on FrugalMomEh.com. Looks and sounds super yummy!!! 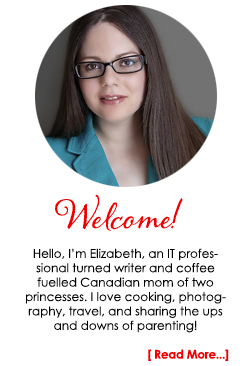 Thank you for the opportunity to guest post. Looking forward to hearing what others think of this dinner! That sounds amazing!! Thanks for the recipe! I love the sound and look of this recipe! I hope my son likes it. THIS is what I want for dinner tonight…..now if the rain would let up for a trip to the store. WOW! This looks good. 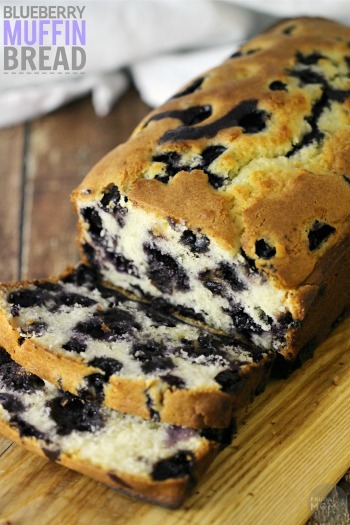 I will be making this tomorrow! Thank you for sharing. 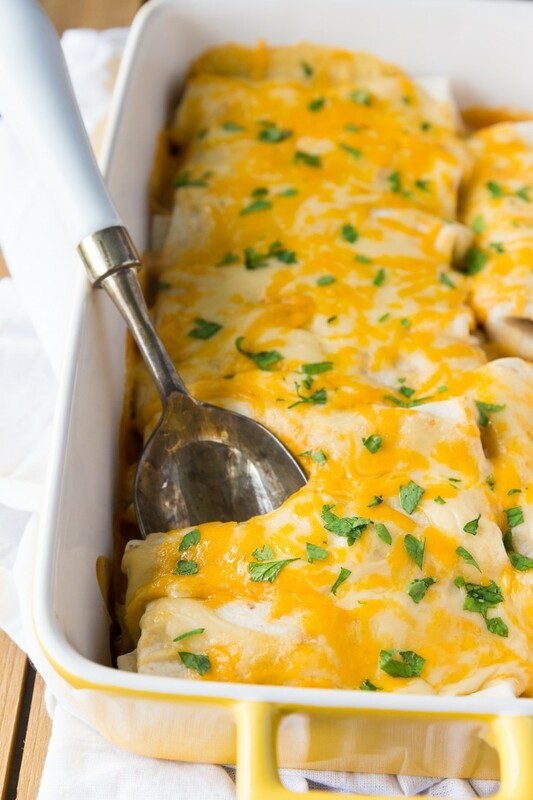 This Cheesy-Chicken -Tortilla Bake seems so easy to make and looks delicious. The fact that it may be frozen and reheated is a bonus. Thank you for this recipe. This looks great! It’s very close to true Mexican food that a minor change would set it right up. Just curious, is it good with roast beef too? I asked Kerrie and she said, she does not think it would work well with roast beef. 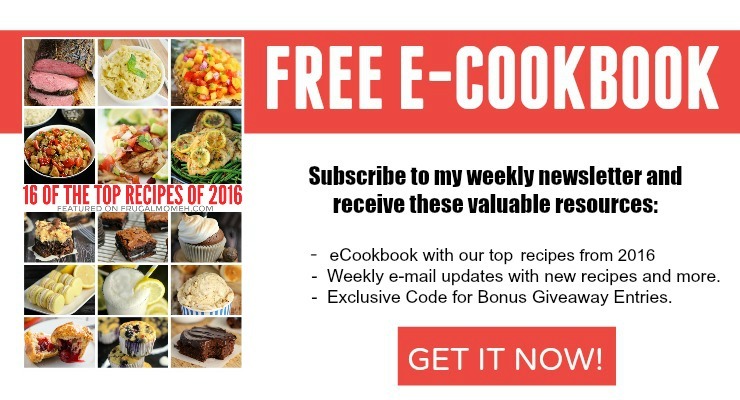 These sound really good, always looking for new chicken recipes. Will have to try this out, thanks for sharing. 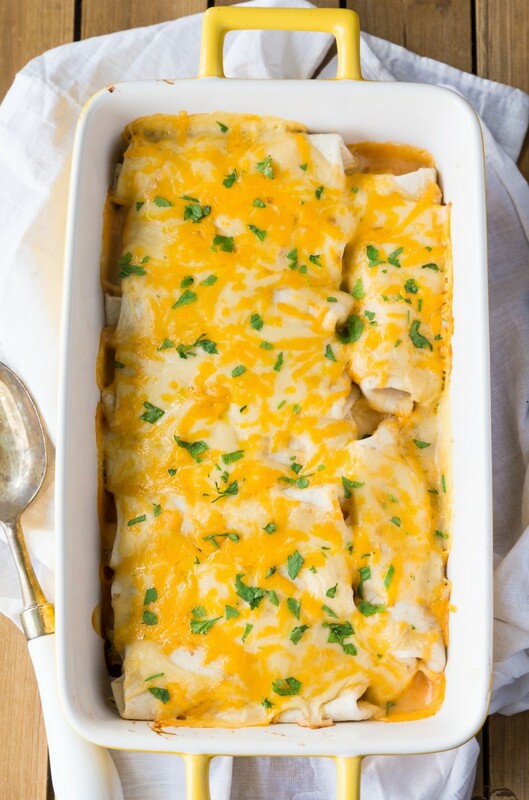 This Cheesy Chicken Tortilla Bake sounds and looks delicious. It also has ingredients that one can find easily. Thank you for this recipe. I hope to use it soon. Chicken is y favorite and this looks so amazing!! Thanks for the delicious recipe that I can refer to often. Woah baby. This looks delicious! 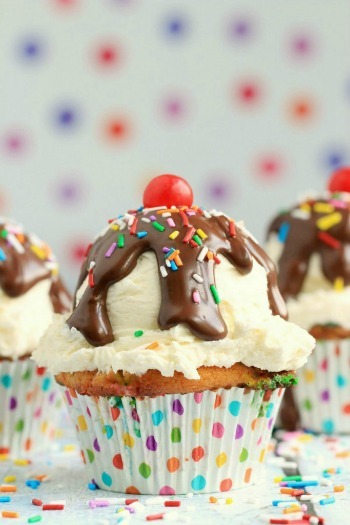 Definitely a crowd pleaser, too- my kids and hubby are gonna LOVE this! How long do you cook if it’s frozen. And do I need to thaw it first. 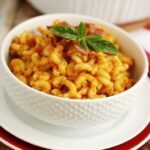 We tried this recipe and we enjoyed it ! 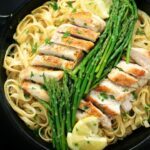 We always have leftover chicken on hand so I am on the hunt for fun, yummy recipes like this one to use it in. My family loves Mexican flavours so this is a surefire hit. My family loves Mexican food and this sounds like a recipe that all of us would enjoy, especially the. cheesy part.